Here are some snazzy birthday facts about 1st of October 1971 that no one tells you about. Don’t wait a minute longer and jump in using the content links below. Average read time of 10 minutes. Enjoy! What day was my birthday Oct 1, 1971? October 1, 1971 was a Friday and it was the 274th day of the year 1971. It was the 40th Friday of that year. The next time you can reuse your old 1971 calendar will be in 2021. Both calendars will be exactly the same! This is assuming you are not interested in the dates for Easter and other irregular holidays that are based on a lunisolar calendar. What day is October 1 this year? There are 162 days left before your next birthday. You will be 48 years old when that day comes. There have been 17,370 days from the day you were born up to today. If you’ve been sleeping 8 hours daily since birth, then you have slept a total of 5,790 days or 15.85 years. You spent 33% of your life sleeping. Since night and day always follow each other, there were precisely 589 full moons after you were born up to this day. How many of them did you see? The next full moon that you can see will be on May 18 at 21:13:00 GMT – Saturday. Fun stat: Your first one billion seconds (1,000,000,000) happened sometime on June 9, 2003. If a dog named Meaty - a Neapolitan Mastiff breed, was born on the same date as you then it will be 262 dog years old today. A dog’s first human year is equal to 15 dog years. Dogs age differently depending on breed and size. When you reach the age of 6 Meaty will be 45 dog years old. From that point forward a large-sized dog like Meaty will age 5-6 dog years for every human year. View the complete list of October 1 celebrity birthdays. Who are the famous October 1 birthdays? Here’s a short list of famous people in history who were born on Oct 1. View the complete list of October 1 famous birthdays. What happened on my birthday – Oct 1st? Texian political delegates convened at San Felipe de Austin to petition for changes in the governance of Mexican Texas. John Philip Sousa becomes leader of the United States Marine Band. The Vienna University of Economics and Business Administration is founded under the name k.u.k. Exportakademie. Baseball: The Boston Americans play the Pittsburgh Pirates in the first game of the modern World Series. František Pavlík is killed in a demonstration in Prague, inspiring Leoš Janáček to the piano composition 1. X. 1905. Ford puts the Model T car on the market at a price of US$825. The Japanese city Handa is founded in Aichi Prefecture. General Suharto puts down an apparent coup attempt by the 30 September Movement in Indonesia. The Seychelles gain internal self-government. The Ellice Islands split from Gilbert Islands and take the name Tuvalu. The United States returns sovereignty of the Panama Canal to Panama. View the complete list of October 1 historical events. Curious about this Fiery Yellow Kokoro? This is a party item you can activate and send to your friends when you play the free game Jump Birthday Party. It’s a fun and easy-to-play mobile game for all ages. Get free 1,000 gold coins when you download today! What does my birthday October 1, 1971 mean? Your birthday numbers 10, 1, and 1971 reveal that your Life Path number is 11. It is a master number that represents intuition, idealism and invention. You have the potential to be a source of inspiration and illumination for people. The following celebrities also have the same life path number: Miranda Richardson, Judith Furse, Martine St. Clair, Craig David, Ronald Reagan, Kim So-hyun, Mary Carlisle, Sylvia Chang, Larissa Riquelme, Natalia Verbeke. 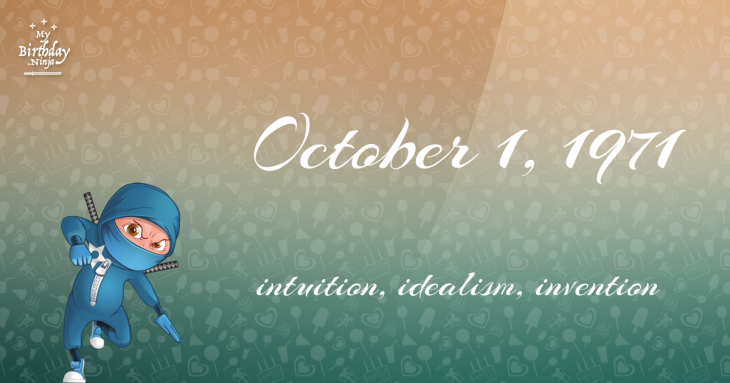 What is the birthday horoscope for Oct 1, 1971? The Western zodiac or sun sign of a person born on October 1 is Libra ♎ (The Scales) – a cardinal sign with Air as Western element. The ruling planet is Venus – the planet of love and beauty. According to the ancient art of Chinese astrology (or Eastern zodiac), Pig is the mythical animal and Metal is the Eastern element of a person born on October 1, 1971. What is the birthstone for October 1? Opal is the modern birthstone for the month of October while Jasper is the mystical birth stone (based on Tibetan origin). The zodiac gemstone for Libra is chrysolite. Lastly, the birthday stone for the day of the week ‘Friday’ is emerald. Fun fact: The birth flower for 1st October 1971 is Cosmos for constancy. What is the Love Match for Oct 1, 1971? When it comes to love and relationship, you are most compatible with a person born on January 19, 1974. You have a Love Match compatibility score of +216. Imagine being in love with your soul mate. On the negative side, you are most incompatible with a person born on December 19, 1958. Your incompatibility score is -146. You’ll be like a cat and a dog on a love-hate relationship. Arf-arf, I want to bite you. Meow-meow, stay away from me! What is a good birthday trivia for October 1? The number-one hit song in the U.S. at the day of your birth was Maggie May / Reason to Believe by Rod Stewart as compiled by Billboard Hot 100 (October 2, 1971). Ask your parents if they know this popular song. I do not know how you feel about this, but you were a female ♀ in your last earthly incarnation. You were born somewhere around the territory of North Europe approximately on 1600. Your profession was builder of roads, bridges, docks. How many babies were born on October 1, 1971? Base on the data published by the United Nations Population Division, an estimated 121,818,445 babies were born throughout the world in the year 1971. The estimated number of babies born on 1st October 1971 is 333,749. That’s equivalent to 232 babies every minute. Try to imagine if all of them are crying at the same time. What is the popular baby name on 1 Oct 1971? What’s your bizarre Florida Man story? The #FloridaManChallenge is breaking the Internet and social media. Some crazy men, women, or creatures from the Sunshine State are making headlines every day of the year including your birthday. Try this fun exercise. Pick your search engine of choice and type in “florida man October 1” and see what kind of wild news headline you will get. This viral craze started in 2013 and gets resurrected now and then. The latest was from Tumblr and found its way to Twitter. As they say, the rest is history. Here’s a quick list of all the fun birthday facts about October 1, 1971. Celebrities, famous birthdays, historical events, and past life were excluded. 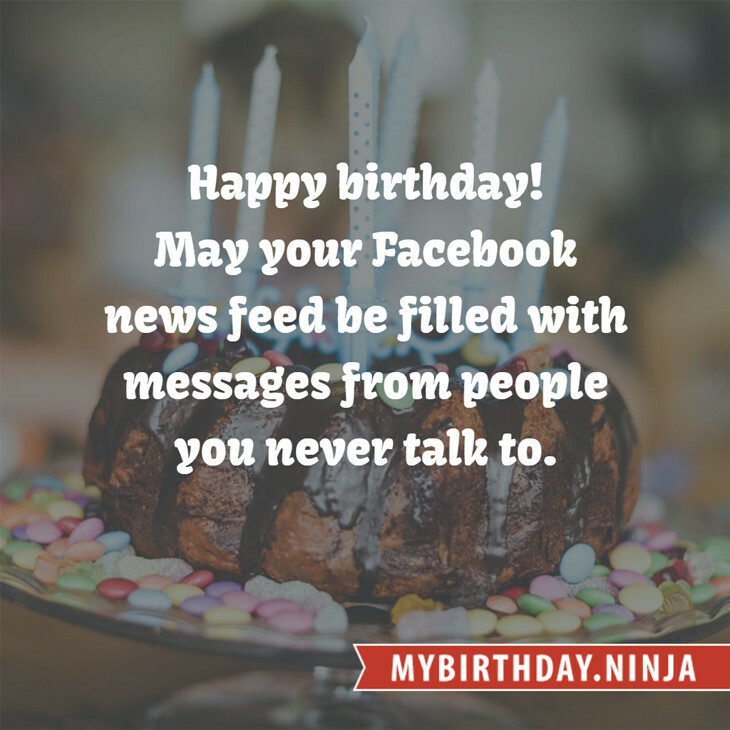 Try another birth date of someone you know or try the birthday of these celebrities: July 5, 1984 – Yu Yamada, Japanese model, actress, and singer; March 4, 1977 – Mike Kinsella, American singer and guitarist (Joan of Arc, Cap'n Jazz, and American Football); March 4, 1979 – Mark Anthony Parrish, American actor, producer, and activist.